We LOVE flower charts and have decided to begin a series of charts we discover out there on the web. 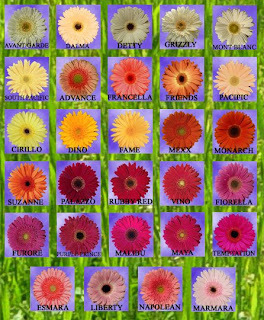 This first chart, Gerbers, gives you the details on 29 different kinds as well as a great source of color selections. Funny thing about being in the middle of the Pacific Ocean, on a small island with about 120,000 people - most flowers used in weddings here are Air flown in. Tropical flowers are of course available, but many Brides love the flowers they grew up with in the more temperate environments. Enjoy this first in a series of Flower Charts!